I just love this Kale Frittata Recipe – so versatile as you can add any vegetable odds and ends that you happen to have left in your fridge, or have just dug up from your garden. Pick lots of Oregano or Marjoram in Summer, and lots of Parsley as well, to give the Kale Frittata extra flavour. Peppers and red onions add a lot of flavour, even courgettes. Full of good things to eat, and incredibly tasty. Enjoy! For the Kale Frittata, heat 1 1/2 tbsp oil in a frying pan, add the onion or shallot and fry gently for 5 mins, then add the garlic for another 3/4 mins and stir so that it doesn't burn. Meanwhile in a large bowl, add the steamed kale, sliced mushrooms, red pepper, beaten eggs, the grated cheese and add seasoning. When onions and garlic ready, add these to the bowl and stir to mix. Pour the rest of the oil into the same frying pan (don't have the heat too hot), then add the vegetable and egg mixture to the pan. The mixture will begin to set around the edges, so with a palette knife or similar, keep loosening it. Cook gently for approx 7 - 8 mins, until almost set in the middle. Heat the grill. Place the pan under the hot grill (make sure the handle will not burn), and wait until the top is puffed up and golden. Remove from the grill. This Kale Frittata can be served straight away, cut up into wedges or squares, or it can be cooled, tipped onto a large plate, then cut up and served on its own or with a mixed salad. 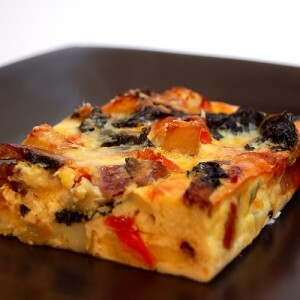 Fritatta is often used as part of Spanish Tapas.